While I would like to say that I have all the time in the world to sew or quilt...that certainly isn't the case. So when an opportunity presents itself, such as a baby shower, I jump at the chance to get out my sewing machine. One of my dearest friends is having her first child in August and this past Sunday was her shower. 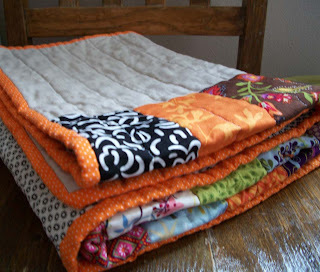 I knew for a while that I was going to make her a newborn quilt and was pulling together ideas when I came across Red Pepper Quilts. A blogger from Australia who creates the most beautiful and modern quilts that I've seen recently and I encourage all who enjoy this art to start following her blog...you'll fall in love with her designs. 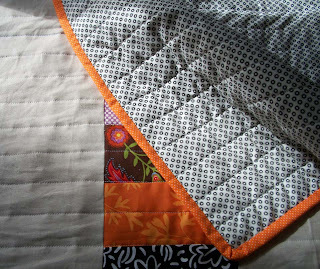 Here is the quilt that I made for my friend. It's a mix of various cotton prints paired with natural linen fabric. At first I thought this was going to be a simple quilt to make; but it turned out that the actual "quilting" was a headache. 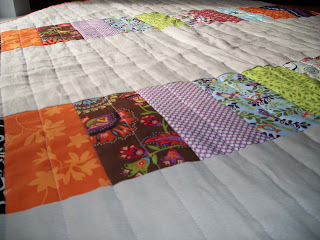 I still am not 100% comfortable quilting quilts. I can make beautiful quilt tops; but I completely stress out when I have to quilt them. Lucky for me, I like using cotton batting and tossing things in the dryer; which gives that antique look; but also hides flaws that most of the time only I can see. In the end this quilt was a big winner. Thanks Red Pepper Quilts for giving me the inspiration.